Edit, view, and inspect PDF boxes. Is there a better alternative to PdfBoxEditor? Is PdfBoxEditor really the best app in Applications category? Will PdfBoxEditor work good on macOS 10.13.4? Before you submit your project to a printing company, you should thoroughly check if all required boxes are present in your ready-to-print PDF and if they align correctly with the printer's marks. When you receive PDF files for further processing, you have to get an overview of the boxes defined by other authors. In case of missing or misaligned boxes, you will have to correct the settings and copy them to all applicable pages. PdfBoxEditor needs a review. Be the first to review this app and get the discussion started! PdfBoxEditor needs a rating. Be the first to rate this app and get the discussion started! Before you distribute your PDF documents, reassure that no confidential data is contained outside the visible area defined by the CropBox. You have got PDF documents with printer's marks but without PDF boxes. Simply add the missing boxes - e.g. 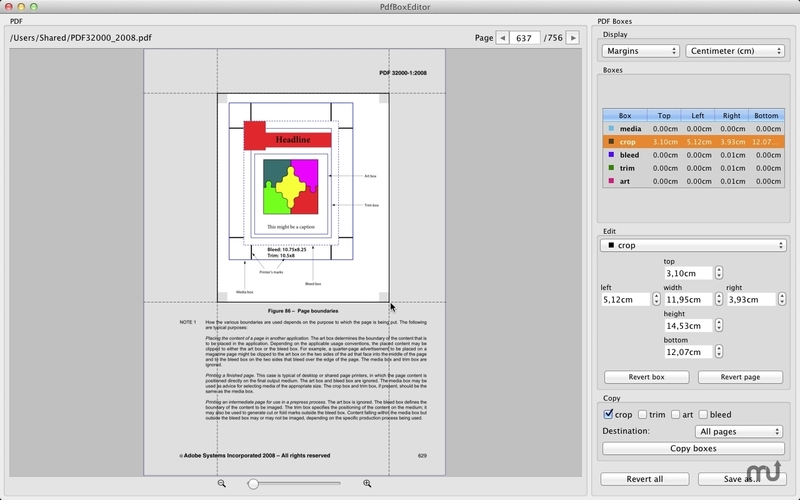 the TrimBox - and use the guides in the PDF preview to quickly and precisely align the box with the printer's marks. Your PDF document has white margins which you would like to reduce for printing or display on a mobile device. Create a CropBox around the relevant page area and copy the box settings to all other pages.